Playing chamber music with others may be one of the most rewarding and inspiring musical experiences a student will have. These small ensembles, where students play one on a part, focus on building valuable skills in musical expression, communication, leadership, and responsibility. During the Academic year, the chamber music program consists of weekly coachings, outreach performances, and student chamber music recitals. Students are placed in groups based on their age, level, availability and recommendation from their private teacher. 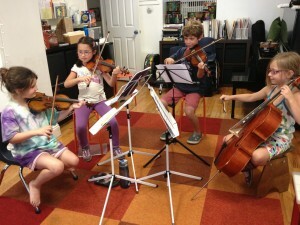 Private study at Silver Music is not a prerequisite. The program is open to string, flute, and piano students. Is my child ready? To enjoy a successful semester of chamber music during the year, students should be at least 8 years old, have strong reading skills and be playing at a book 4 level (violin) and book 3 (viola and cello). Students must be recommended to participate by their private teacher. Please speak to your teacher if you are interested in the chamber music program. 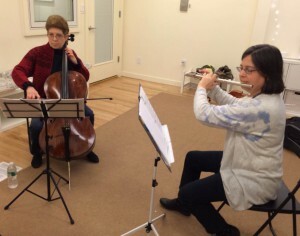 Participation in Suzuki group playing classes serves as preparation for chamber music, as the advanced classes typically include some work on reading multiple-part pieces. During the summer months, we offer week-long camps for students with intermediate reading skills with daily professional coaching and practice time. We are more flexible with age and level in the summer, and can accommodate students as young as 6 years who are strong readers. This is a great time to get a taste of what chamber music is all about! 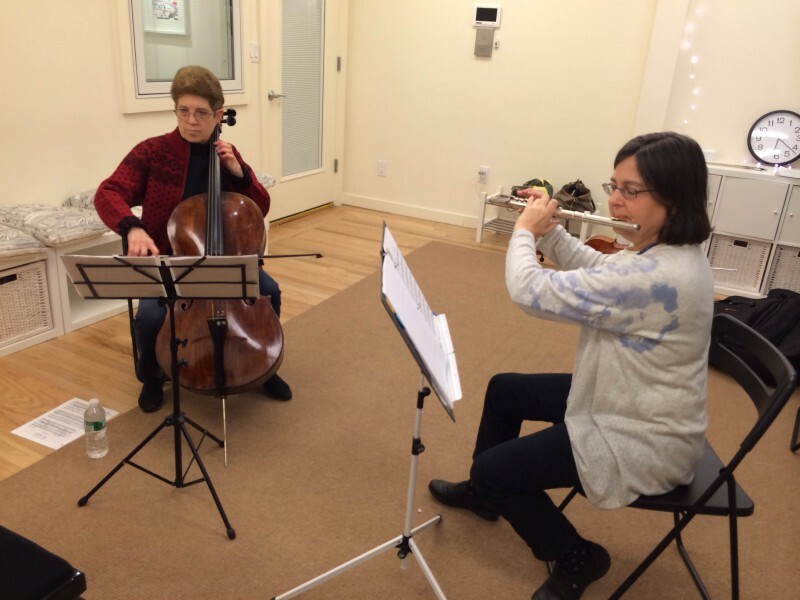 The daily schedule includes extended coaching sessions, recording and practice strategies, a short time for independent or guided practice, and other activities meant to develop the skills that are fundamental to chamber music (listening, sight-reading, teamwork, etc.). Our week culminates with an informal performance and/or a neighborhood outreach performance. Leadership: Students play one to a part. Everyone at some moment will need to be the leader! Collaboration: Students learn how to work together and communicate individual ideas about the music. Responsibility: Each part is equally important. Students learn that they need to come to rehearsal prepared on their part and be present and punctual. Enduring Friendships: The friends you make playing chamber music become your lifelong friends. Enrollment in our Sunday Program for serious string students in Book 4 and above is by teacher recommendation and includes intensive chamber music and musicianship classes along with both formal and informal performances throughout the year. Click HERE to watch a Theory Project compilation from our past semester of musicianship. We offer 5-week or 10-week courses for semi-professional and amateur musicians interested in making music together. Each session includes 45 minutes of rehearsal and 45 minutes of coaching by Silver Music faculty and guest musicians. Repertoire is carefully selected based on the players’ ability and interest. Ensembles perform at the end of the semester in an informal recital open to friends and family. Learn more by clicking here!